Compare Watering Systems — Saving Water Partnership. Pros and cons for the various types of irrigation systems. Irrigation Tips — Oregon State University Extension. Ponds & Birdbaths — Washington Department of Fish & Wildlife. Collection usually refers to a device that captures rainwater run-off from roofs, then stores it. Most people collect water throughout our rainy winter with the expectation of using it to water their gardens during the drier months. But there is a fatal flaw with that plan. Most barrels, though they seem large, don’t really hold much water. Most barrels for residential use are 50–100 gallon capacity. Simple math show that a 1,600 sq. ft. house receiving 30" of rain (we get more than that in Clark County, WA) on its roof would produce 27,840 gallons of water. How many barrels are you prepared to install into your yard? And how much water do you need to irrigate your property? Delivering 1" of water to a 5,000 sq. ft. lawn, requires 3,115 gallons every time you water. See the math. Let’s say you will water twice a week for perhaps 5 months of the growing season. That comes to 124,600 gallons of water to irrigate your lawn; almost 4.5 times the amount of rain you get off your roof during the entire year. So even if you could save all the water from off your roof, it still wouldn’t do the job of irrigating an average traditional lawn. Well, you’d have a zillion barrels, so you’d not have room for all of that grass! Even wanting a rain barrel for the purpose of drinking water can be problematic. Be absolutely sure the barrel and any piping/tubing connected is safe for potable water. Observe water safety standards. And consider that the (some say outdated and incorrect) 8 ounces of water 8 times a day requirement for humans equals 182 gallons of water for each human in the residence per year. You’d need perhaps 2 rain barrels for each person, and that doesn’t include bathing, dishes, laundry, cleaning. We present the these staggering numbers to help you better understand the impact of using rain barrels. Because water conservation is important, and storage of stormwater isn’t always a good solution, we advocate habitat-friendly landscapes with drought-tolerant plants, minimal traditional turf lawns, or use of lawn alternatives. We see changing the way we garden as a better solution than trying to store water in rain barrels. See Other Sections of this archive for information about lawns and their alternatives. If you don’t actually need to store stormwater run-off, consider managing it with rain gardens and swales. Rain barrels can be helpful in stormwater management. See the next topic, Stormwater Management further down the page. Reasons NOT to Buy a Rain Barrel — Thought Worthy. Yeah, there are some cons to balance out the pros (as if the math above didn’t discourage you). Still want to collect and store rain water? Consider a much larger vessel. Cisterns — OPB Earth Fix. Need more capacity? Go beyond the barrel. Cisterns — King County, WA Department of Natural Resources & Parks. Some basic facts about cisterns. How to Build a Rain Barrel — Watershed Stewards, Clark County, WA and WSU Clark County Extension. Rain Barrels — Watershed Stewards, Clark County, WA and WSU Clark County Extension. Older resource. Overall good information. Start New Plants Off Right — Saving Water Partnership. Water Conservation — Clark County Green Neighbors. More about water conservation, but not necessarily in the garden. Water-efficient Plants for the Willamette Valley — Oregon.gov. WaterSense — US Environmental Protection Agency. Erosion can be a problem in any landscape even if there isn’t much slope. There are various types of erosion, but in the video below, they are talking about how the flow of water over or through the soil can cause erosion. But as good as mulch is at preventing erosion, it isn’t as good as a dense planting of live plants. See video below for just how much cleaner the planted soil water overflow is than without plants or mulch. How Plants & Mulch Prevent Erosion — Goodnight Design. Contains very nice video demonstration by Fun Science Demos. Related Resources: Plant Lists for appropriate plants to prevent erosion. Rain gardens are large depressions in the ground that fill with rain water run-off from impervious or compacted surfaces. They are constructed to catch a large amount of water that is then absorbed into the soil. This slows the flow of stormwater, and keeps it from entering the storm sewer system which help prevent erosion keeping streams, rivers, lakes and bays clean. Rain gardens are almost always vegetated. This is for both practical and aesthetic reasons. Rain garden plants are those adapted to well-tolerate periods of extreme wet as well as extreme dry. As it turns out, such plants are those that grow in riparian areas. We can use any riparian plants that will survive in our local area. But at NBB, we encourage use of native riparian plants which enhance the function of the rain garden and also satisfy the needs of birds, insects and other wildlife. A swale is a type of rain garden that is more long and narrow, like a stream. Many of the resources listed include plant lists specific to rain gardens. 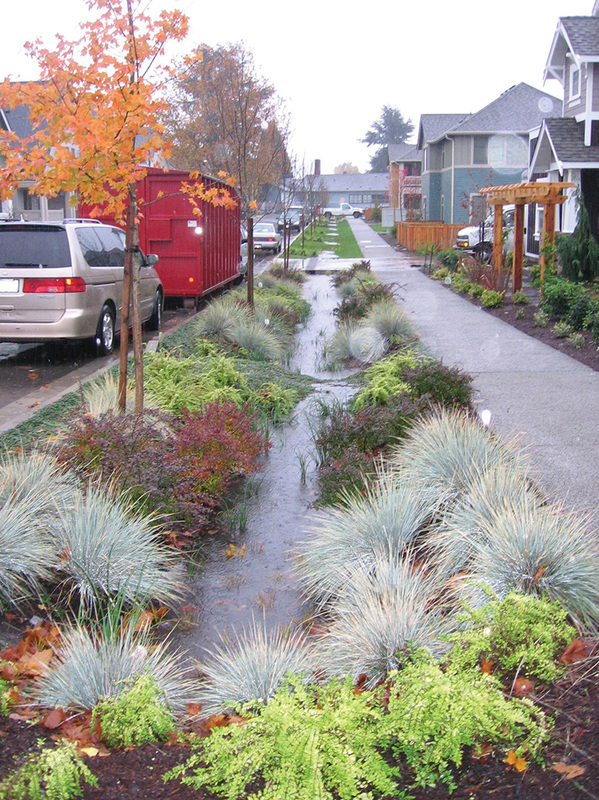 How to Manage Stormwater: Rain Gardens — City of Portland, OR. When rain water moves across roadways and developed land, it carries with it oil, chemicals, and even garbage to our streams. Many land developments in Clark County implement Low Impact Development (LID) methods to manage water in ways that promote natural water movement in an ecosystem or watershed. LID practices include rain gardens, green (vegetated) rooftops, rain barrels, bioretention facilities, and permeable pavements. Natural landscape features drain stormwater and use it as a resource rather than waste. You can use the map on the website to go on a self-guided tour of Stormwater LID sites in our county. The website also has several videos about LID if you want to learn more. These resources can be great inspiration for you to add landscape features such as rain gardens to your yard to manage stormwater. Oregon Rain Garden Guide — Oregon State University, Oregon Sea Grant Extension. Rain Gardens — Watershed Stewards, Clark County, WA and WSU Clark County Extension. Rain Garden Handbook for Western Washington — Washington State Department of Ecology, WSU Extension, Kitsap County, WA.